Here is a quick battle report from a game which featured the Black Wolf and Federated States in America against an alliance of the Russian Coalition and the Republique of France (sides were rolled randomly). 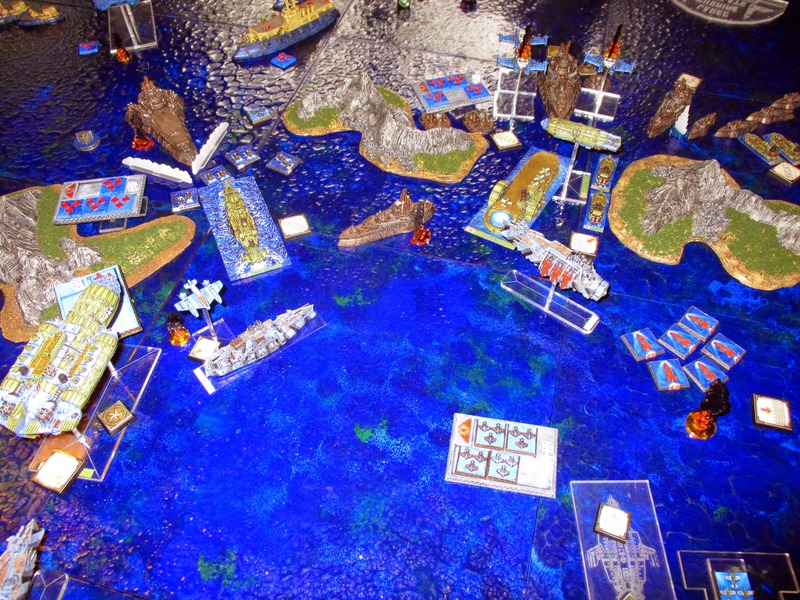 In this game the objective deck from v1.1 was used (with the cards specific to the old rules removed). The pictures are a little variable as there was a thunderstorm during the game which changed the light conditions. The American fleet was built around aggressive boarding, with many Kinetic generators, built around a Valley Airship, San Francisco Assault Carrier and Boston Attack Submarine. The Black Wolf meanwhile had the usual assortment of potent Nemesis Battle Cruisers, Manticore Skimmers, Fury Frigates, and a Affondatore Battle Carrier 'borrowed' from the League of Italian States. 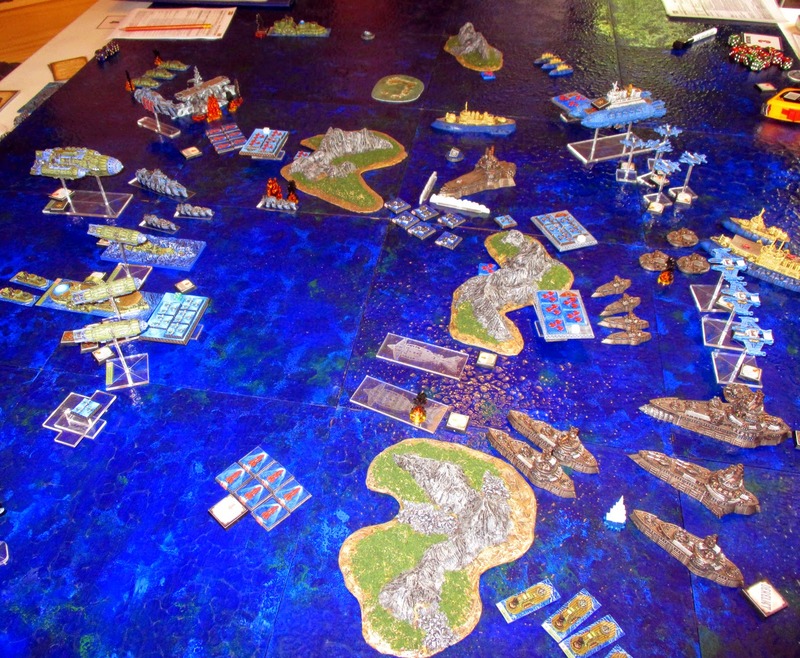 Across the table the Russians formed a wall of steel with a Khatanga Heavy Battleship, A Dudinka Battle Carrier and Azov Battle Cruiser and Tiksi Support Cruisers. The French had prepared an aerial strike force with a Tourbillion Sky Fortress, Voltaire Interceptors and Frelon Small Bombers, supporting a Couronne Assault Carrier and Magenta Battleship. The Russians deployed in a central block, seeking to concentrate their mortar fire and punch through the enemy lines, supported by the Voltaire interceptors. The Black Wolf and American's deployed the bulk of their force opposite, the sea churning with tiny submarines. 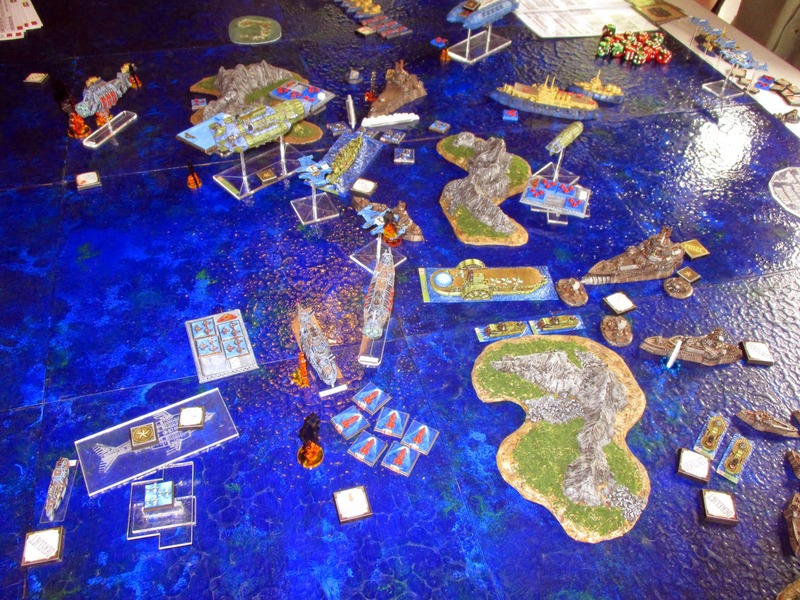 The Russians and French get the best of the early exchange of fire, knocking out the sleek and deadly Fury frigates before they could wreck havoc, while a fortuitous hit shuts down the shield generator on the Affondatore Carrier, opening the carrier up to a devastating barrage which starts several fires on the elegant ship. 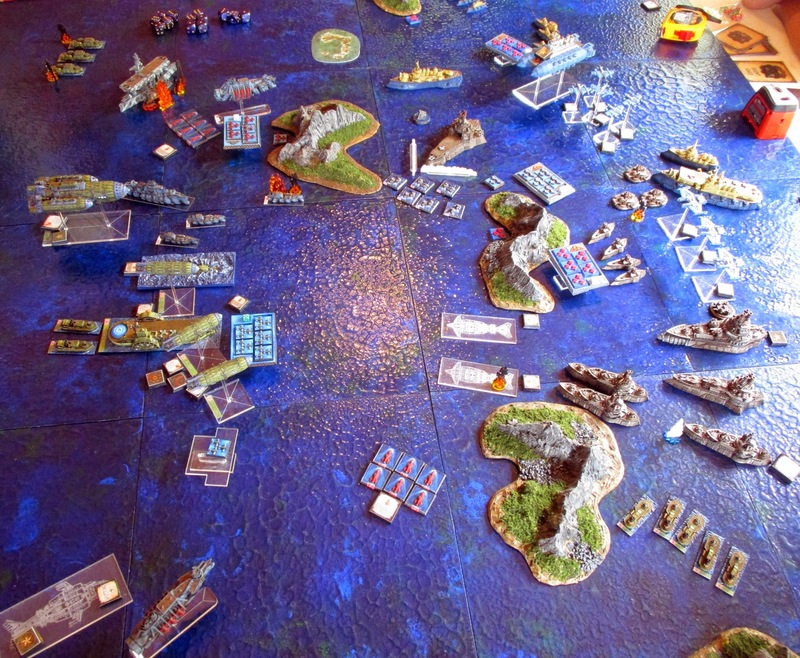 The American Corvettes spring forward, their reckless marines capturing a Tiksi cruiser and provoking an angry retaliation from the Russian fleet. Mean while the American Turtle submarines swarm the Dudinka Carrier, and the Boston surfaces to finish the job, however desperate hand to hand fighting from the Russian conscripts momentarily prevents the capture of the giant ship, and opens the way for the French Frelon bombers to mount an unlikely counter-assault and capture the American submarine. Things get worse for the Americans on the other flank when the Annapolis Battle Cruiser which has already been damaged by salvos of French rockets and gunnery attempts to capture a booby-trapped objective, and is destroyed in a massive fireball. Devastating Black Wolf gunnery smashes the remaining Russian Cruisers and sends the Azov Battle Cruiser beneath the waves. The American's unleash their assault with marines from the San Francisco Battle Carrier storming the Khatanga Battleship and prizing it, while marines from the Valley airship descend from the clouds to prize the Dudinka. The Black Wolf also concentrate their fire and smash the Magenta battleship into a burning hulk. In response the French destroy the burning Affondatore. 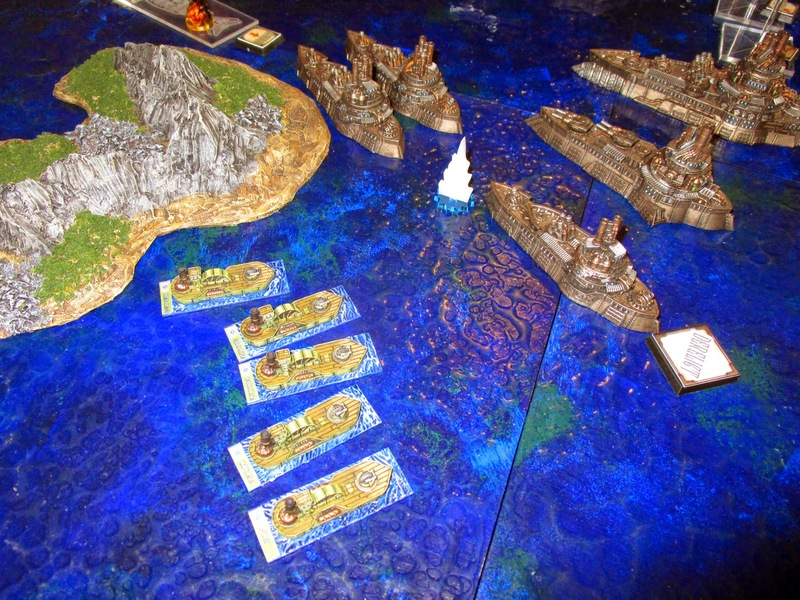 And both French and Russian fleets ruthlessly destroy the remaining small ships of the American and Black Wolf fleets. 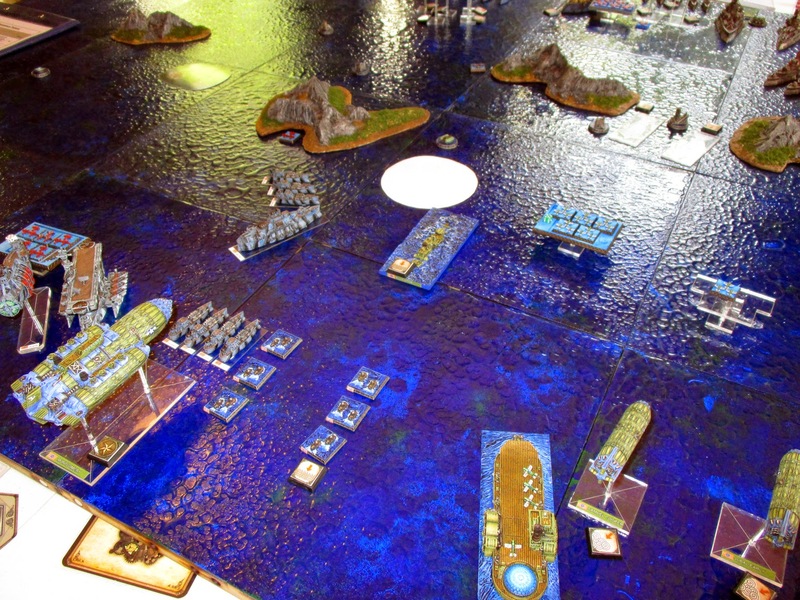 At the end of the third turn the French and Russians had completed their fleet order of killing all enemy small models (just) and the massive haul of victory points from the Affondatore Carrier (415 points) assures they pass the 50% requirement. 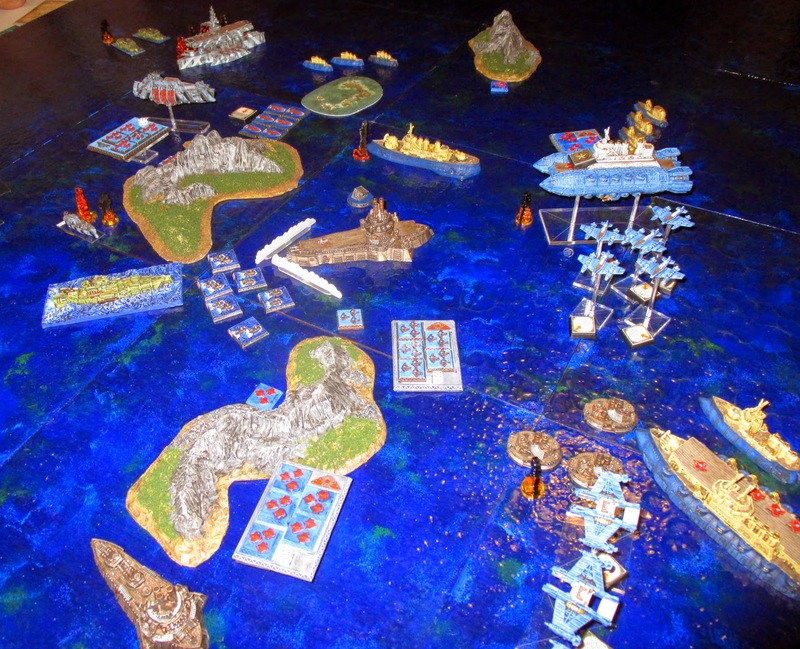 In response the Black Wolf and Federated States of America who had to capture the enemy commodores to secure victory have only captured the Russian Commodore, the French Commodore remains relatively safe in the Tourbillion Sky Fortress, so despite scoring more victory points, they are defeated by the French and Russians. This was a close and enjoyable game - in retrospect we (the FSA and Black Wolf) should have traded the kill enemy commodore for the 70% fleet order from the outset, as we lacked the means to really go after the Tourbillion (I had hoped the Lee Scout Ships could achieve this but they were too far from their target and suffered too much damage trying to re-position to achieve this). The Russians suffered huge losses but were instrumental in killing most of the smalls, while the French suffered much lighter losses, and so were able to mop up the final models with relative ease at the end of turn 3.